Richard Laing is a conductor, violinist and writer of remarkable versatility. He is sought after as a conductor of opera, ballet and orchestral concerts, and is one of the the UK’s foremost choral directors. In an age of increasing specialisation, Richard is a true polymath, bringing a wide range of knowledge and influences to his music-making. Richard is Music Director of Nottingham Harmonic Choir, Somerset Chamber Choir, Leicester Bach Choir, Cambridgeshire Choral Society, Bach Camerata and Leamington Chamber Orchestra, Principal Guest Conductor of Birmingham Philharmonic Orchestra and Hallam Sinfonia, and Associate Conductor of Chandos Symphony Orchestra. Richard was the first Conducting Scholar at Birmingham Conservatoire, where after nine months of study he was awarded his Masters Degree, a Postgraduate Diploma, and the Postgraduate Prize for the most outstanding contribution to the musical life of the college. 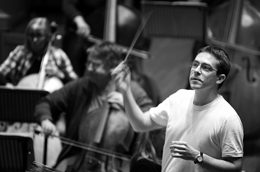 Immediately thereafter he was supported by the Foyle Foundation to work intensively on operatic conducting at Dartington with Diego Masson, and appointed to the post of Associate Conductor with the virtuoso young ensemble Sinfonia Cymru. Conducting highlights of the 2018-19 season include Britten’s War Requiem in Nottingham’s Royal Concert Hall, Bach’s St John Passion with James Gilchrist in Wells Cathedral, and his debut with the Orchestra of the Swan. 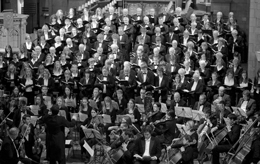 Richard regularly prepares choirs for the nation’s top orchestras and for conductors such as Sir Mark Elder and Cristian Mandeal. For the Hallé he has prepared Alexander Nevsky, The Music Makers, The Planets, Poulenc’s Gloria and Belshazzar’s Feast and undertaken off-stage conducting and pre-concert talks; for the BBC Symphony Orchestra has has prepared Carmina Burana. Richard’s operatic work has included The Magic Flute, The Marriage of Figaro, and Malcolm Williamson’s English Eccentrics (Birmingham Conservatoire), La Traviata and La Bohème (Dartington Festival Opera), Albert Herring, Hansel and Gretel and Noye’s Fludde (Operamus), Adrian Cruft’s Dr Syn (Kent Opera) and Handel’s Orlando (Pigotts). He has collaborated with some of the world’s finest instrumentalists and singers, including principal players from the New York Philharmonic, Orchestre Symphonique de Montréal, Dresden Staatskapelle, Amsterdam Baroque, Munich Philharmonic, CBSO and RLPO, as well as Brigitte Engerer, Emily Pailthorpe, Robert Plane, Anthony Halstead, Robert Hayward, Neil Jenkins, Peter Wedd, John Turner, Alan Hacker, Peter Auty, Joanne Lunn, Adrian Bradbury, Richard Jenkinson and Catherine Wyn-Rogers. He has a close working relationship with some of the brightest young stars of the classical music world, including Oliver Coates, Callum Smart, Alec Frank-Gemmill, Leonard Schreiber, Matthew Jones, Mikhel Poll, April Fredrick, Katie Trethewey, Marcus Farnsworth and Di Xiao, and has collaborated with a diverse range of cross-over artists, including Alfie Boe, Tim Minchin and Radio 1 DJ Bobby Friction. 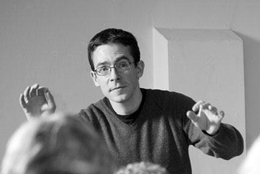 Richard has premiered dozens of new works including works by Paul Patterson, Deborah Pritchard and Bernd Redmann, and is in great demand as an adjudicator and coach, and as a leader of orchestral and choral workshops around the UK. Prior to taking up the baton Richard studied violin and chamber music at the University of Illinois with Peter Schaffer and Michael McClelland, and violin at the Royal Northern College of Music with Richard Ireland. Richard is a core player of the Orchestra of the Swan, and freelances with English Symphony Orchestra, the Royal Shakespeare Company, Covent Garden Sinfonia, Southern Sinfonia, Welsh Chamber Orchestra, Longborough Opera and Orchestra da Camera. 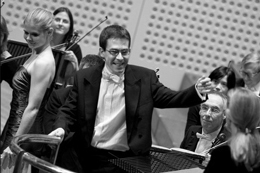 Among the orchestras with whom he has appeared as guest leader are Birmingham Philharmonic Orchestra, Cambridge Philharmonic Orchestra, Sinfonia of Birmingham, Queen’s Park Sinfonia, Warwickshire Symphony Orchestra, Chandos Symphony Orchestra and the Forest Philharmonic. A keen and active chamber musician, Richard’s chamber music partners include David Le Page, Cordula Kempe and Eduardo Vassallo. In his limited spare time Richard pursues a wide range of academic interests. His undergraduate work in Manchester on John F. Kennedy’s policy in Vietnam won him the Kaiser Award for American History. He he has presented papers on subjects as diverse as apocalyptic cinema, M.C. Escher and reality TV at the International Conferences on Film and Literature at Florida State University, and on Wagner’s Ring cycle at the International Wagner Symposium at the University of Adelaide. His essays on productions of Lohengrin, Die Meistersinger von Nürnberg and Parsifal at Bayreuth have appeared in Wagner News. His current research interests include diegetic classical music in film, the US President as depicted in Hollywood film, and Working Memory span in conductors and pianists.